There’s a story behind every home and every project that Habitat for Humanity of Cabarrus County undertakes. What starts as a routine initiative for our volunteers and service personnel often turns into a heartwarming feeling of community and comradery. Christy walked into the Concord Fire Department one morning with one goal in mind: to find a way to make her home safer for her family. Her husband’s struggle with Multiple Sclerosis and her own battle with Epilepsy had already established them as survivors in the face of illness that made life a little more difficult. However, that didn’t inhibit their desire to continue building their family and living their life to its fullest. Their home, however, was inhibiting their quality of life. Every day, Christy and her husband lived in fear of what may happen were one of them to fall on the steps outside of their home that were in desperate need of repair. What would seem like a small issue to the average homeowner was presenting a challenge to the couple, and rightly so. Multiple medical emergencies had been halted or challenging due to EMS personnel being unable or apprehensive in bringing equipment up those stairs. “I knew I needed help,” says Christy, who initially was unsure about asking for assistance. 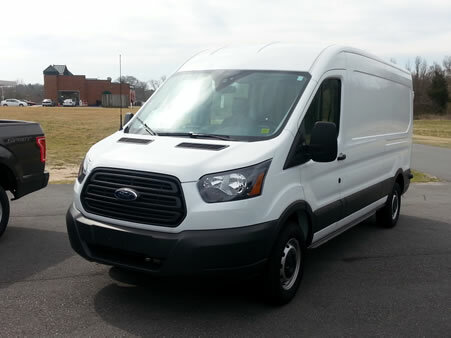 That’s when she reached out to the fire department who directed her to Habitat for Humanity of Cabarrus County. 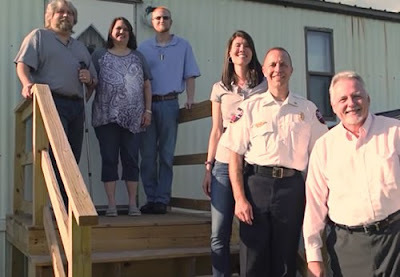 Resource Development Director Katie Page and Concord Police Chief Ray Allen, both Rotarians in the Concord Rotary Club, took this project to their group and put together a of team of people to help this family. Habitat helped put together the plan and secured materials and Rotarians and the fire department took care of the labor. “It was an excellent opportunity for Rotarians to fulfill their obligation to give back to the community in a way that makes an immediate impact on someone’s life,” said Rotarian and Concord Police Chief Ray Allen. From the fire department’s perspective, by helping take care of this problem, they may actually be preventing a need for their service in the future and keep homeowners safe. Not only did Habitat do the requested repairs making sure the steps were secured and safe, but this team of volunteers also built a covering over a portion of an already existing wheelchair ramp for additional safety. In 2015, Habitat Cabarrus helped 35 families with repair projects. 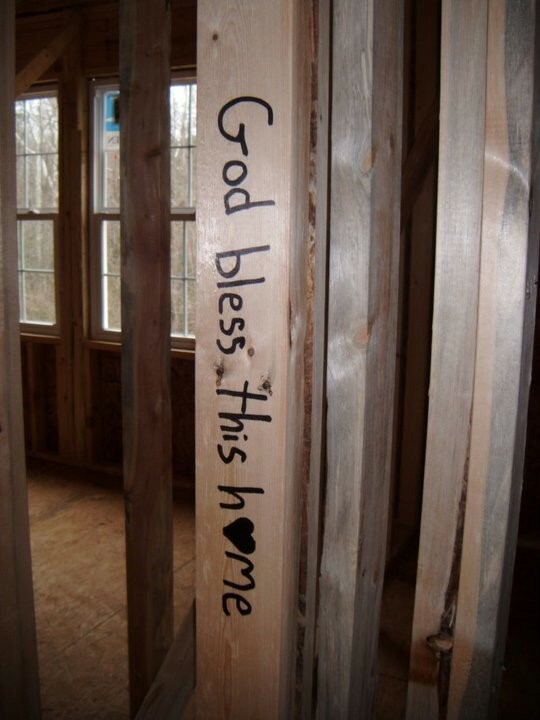 If you or someone you know is in need of critical home repairs , visit our website to learn more about how to apply for services at www.habitatcabarrus.org under What We Build/Home Repairs. A special family has created a unique partnership with Habitat Cabarrus as a way to give a house warming gift to our new homeowners. Earnest and Angie Bostick have committed to create a farm table for every new Habitat Cabarrus homeowner and their first gift was to the Hernandez family, whose home dedication was last week. Earnest and his family had just spent Christmas Eve at his grandmother’s house and were making their way back home. Earnest was only 6 or 7 years old at the time, but he vividly remembers the cold night as he rode home with his dad, mom, brother and sister. As they got closer to home, they saw a man that appeared to be passed out on the ground underneath a nearby tree. Rather than drive by him, they stopped the car. Earnest’s dad then exited the car and realized that the man was passed out drunk. So he picked the man up, put him in the car, and took him home. This was one of the many times that Earnest witnessed his dad’s acts of kindness. As an adult, Earnest strives to be more like his dad. 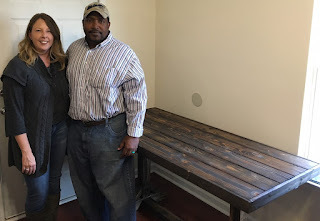 His love for wood working and desire to give back to the community helped him and his wife Angie come up with the idea of making tables for their community. “A family dinner table is a great gathering place for eating, talking, homework and making it feel like a home,” says Angie. 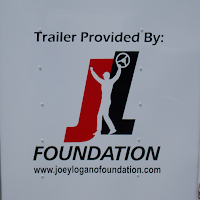 They have also built many tables for their family, friends, neighbors and other charitable organizations. Earnest has many dimensions of different styles of tables so he starts with his cut list. After buying the materials, he measures out, cuts and labels each piece so they are ready to assemble. From start to finish including stain and/or paint, it takes about a full day (8-10) hours. He's a true perfectionist in his work and really tries to bring great quality to each piece. 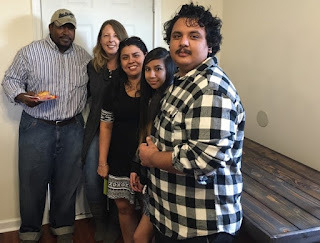 Our partner families work so hard to put in sweat equity hours alongside community volunteers to make their dream of purchasing and owning a home a reality. As they assume their 0% mortgage after their home dedication, it is so nice to know that members of the community care enough to give them such a special gift. My Dad says it’s lawn season now that Autumn is knocking at the door… Last month he aerated, reseeded, and put down wheat straw so that his yard will be green and gorgeous in the Spring. Once he completes the yard work Dad tackles repairs. 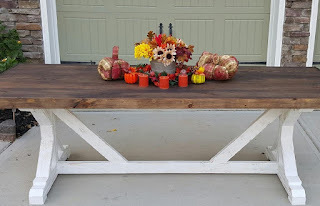 Sometimes the porches need work – railings may need replacement or paint touch-ups to prevent wood rot. Other times the roof needs a few shingles, or windows must be replaced, or walls painted, or… The list goes on. 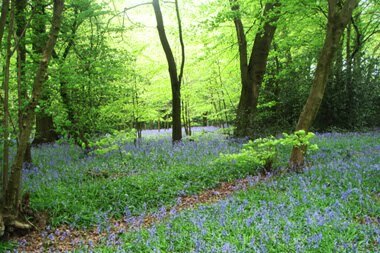 Twice a year – Spring and Fall – Dad looks over the house making sure that small problems are found and repaired. Otherwise small problems become big problems. An old proverb says: For want of a nail the shoe was lost. The proverb lists the cascade effect of the missing nail. 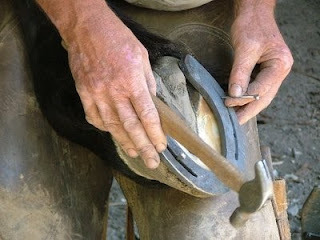 No nail for the horseshoe eventually leads to a battle and kingdom being lost… all for the want of a horseshoe nail. Jeweldine and David met like many do – at work. Jeweldine worked at a local mill and David had a seasonal position during summer break from college. It was love at first sight. Jeweldine knew immediately, “He’s the one for me.” Over time David and Jeweldine married, raised a child, and later raised two grandchildren. They reared other children through the years because the Steele’s are givers and doers. Until David got sick. Until they couldn’t do everything any more. As the son of a former Concord police sergeant, David Steele is the type of man who knows the importance of the horseshoe nail. David prefers to stay on top of problems too. When he worked at Cannon Mills, followed by the hospital in Concord, and finally Barber Scotia College he was the guy who made sure the i’s were dotted and the t’s crossed so issues stayed small. Then his first heart attack in 2003 changed things. David had another heart attack a few years later, followed by multiple strokes. He battled cancer and still contends daily with congestive heart failure. David relies on two machines to circulate his blood and can barely walk. His wife of 32 years – Jeweldine – left her work as a hairdresser to look after David. She says with a smile in her voice, that looking after him is a full-time job. 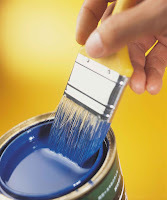 Without regular home maintenance small problems become big problems. Twelve years of increased neglect due to David’s health issues led to an unknown big problem. In 2015 Jeweldine realized they needed help and reached out to Cabarrus County for assistance winterizing their home. Workers discovered a badly-leaking roof. The winterizing crew asked Habitat Cabarrus if they could help the Steele family fix the leak. 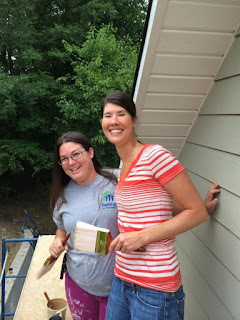 Habitat Cabarrus went to the Steele’s home and assessed the roof. Simply fixing the leak was not going to help the problem. The problem had gotten too big. The horseshoe nail stage had passed. The Steele home needed an entire new roof - and roof replacement is neither quick nor inexpensive. For want of a nail the battle for the roof was nearly lost. And losing this battle would have far-reaching repercussions for the Steele’s. If the roof wasn’t repaired, the city could condemn the home. If their home was condemned, where would the Steele’s live? They owned their home but were not wealthy, else the roof would have already been taken care of. Public housing was the likely destination. Yet how would David and his illnesses and ailments handle the shift? And frankly, who would physically move the Steele’s from their home of 30 years to a subsidized apartment? If there was any possible way, the Steele’s needed to stay in their home. 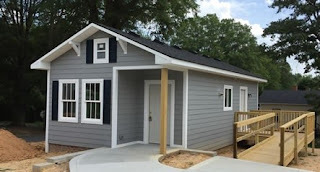 Habitat Cabarrus puts faith into action by helping to build, renovate or preserve homes because affordable housing is a foundation for breaking the cycle of poverty. As the hymn and lyrics by William Cowper say, “God works in mysterious ways, His wonders to perform.” Fortunately, (or mysteriously) Habitat Cabarrus had received a special grant earmarked for critical repairs and the Steele’s roof met the criteria. It took weeks for the roof replacement work to be completed. Roof replacement required professional roofers. Randy Goodnight with Goodnight Construction generously agreed to help. 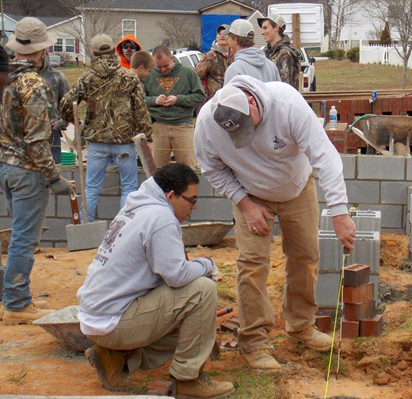 They had other work commitments they needed to meet before they could help Habitat Cabarrus and the Steele family. In the interim, the ceiling in the main living room sprang a leak so large that the Steele’s had to place a bucket under the leak to catch the water. Romans 8:28 is a good reminder that God causes all things to work together for good to those who love God and to those who are called according to His purpose. 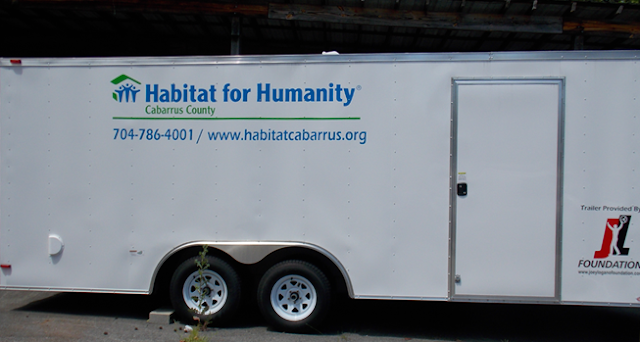 Habitat Cabarrus is honored to serve His purpose and our community through our critical repairs program. If you would like to learn more about our home repair program please click here or download the Home Repair Application for Assistance and bring it into our offices. 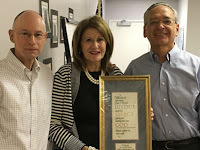 Habitat for Humanity of Cabarrus County would like to thank outgoing Board President Pam Cain for all of the service and leadership she has provided our organization during her time as President. She has done a great job with our organization and we admire the dedication she has shown. To say thank you, Executive Director Dave Zablotny (pictured right) presented her with a small token of appreciation. Taking her place as Board President is Doug Stafford (pictured left). 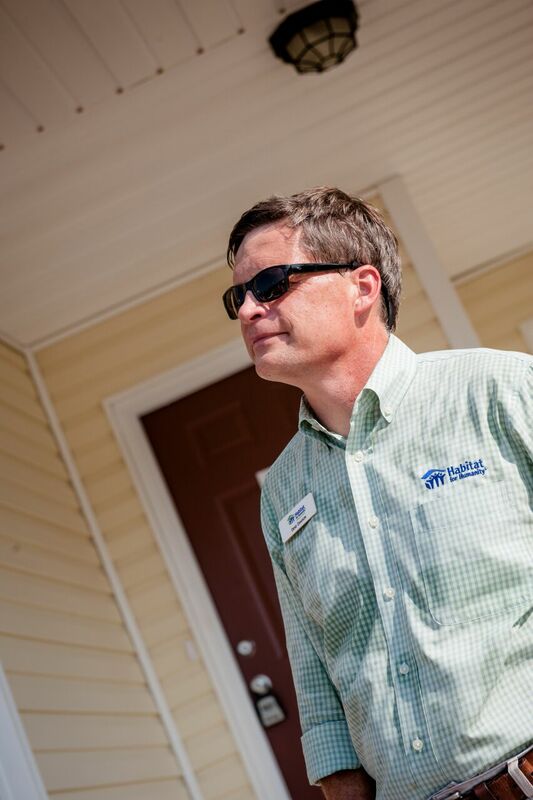 Doug has been a member of our Board for several years and we are very excited for him to begin leading the Habitat Cabarrus Board of Directors. 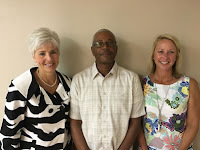 Along with a new Board President, we also have a few new faces joining our team. We've got four additions to the Board, including Dianne Snyder (pictured left), A.J. Clark (pictured middle), and Betsy Burchfield Handler (pictured right). Not pictured is Ward Childress. We're thrilled to have these four represent our organization and join us in making our community a better place. We're looking forward to accomplishing many great things with our new Board members in the future. While it's always exciting to have new Board members join our organization, it's still tough to see outgoing members leave. 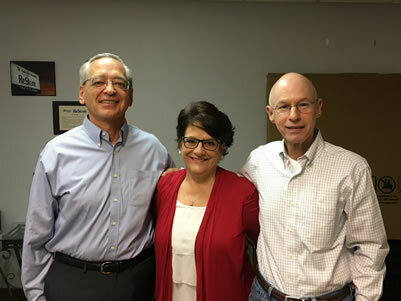 Therese Roberts (pictured middle) is one such member, leaving our team once her six-year term on the Board is complete. Therese served two of these years as Board Chair. 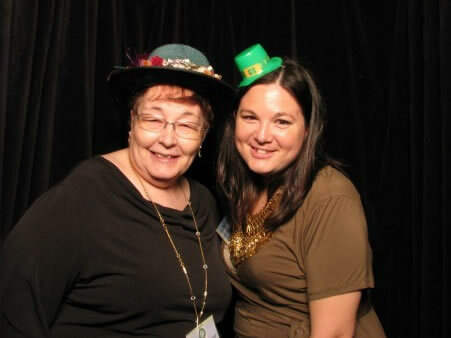 We greatly appreciate Therese's service and admire the dedication she's shown to our organization. The other day my husband and I watched a beautiful scene unfold. A boy about eight helped his two-year-old sister play on her scooter. She was determined to ride it no matter what. He was incredibly kind and patient with her. Despite the crying and tantrums from her repeated unsuccessful attempts - he remained calm and loving. As we viewed the interaction we knew that he was modeling the behavior he’d received from their parents. We also knew that the sister would be just as patient, kind, and loving with her own children one day in the future. We mimic the behavior we’ve seen and perpetuate the behavior we’ve experienced. I once heard a story about cooking that bolsters the point. A mother demonstrated how to cook a roast to her daughter. When she cut a third of the roast off and turned it sideways in the pan before placing it in the oven the daughter asked her why she cut it. The mother paused for a moment and then picked up the phone. The mom called HER mother and explained the situation. The grandmother laughed so loudly the granddaughter could hear. It seems the grandmother’s roasting pan was too small to hold the roast in one piece but it would fit if a section was turned sideways. The mother had been cooking her roast the same way - even though she had a larger pan. How many times a day do you take unconscious action based on how your parents, “Cut the roast”? Do you drive American or foreign? Do you attend church? Volunteer? Yell or sulk when angry? Do you wear seat belts? Jewelry? Plaid? We spend a great deal of our lives, “Cutting the roast”. When I wash dishes I utilize an order to the process. First washed are glasses, then silverware, then plates, and finally pots and pans. There’s a logic to the system - the water is cleanest at the beginning so you wash items from least dirty to dirtiest. It’s so ingrained I don’t even think about the process until I watch my husband wash dishes in his own way. Then… I have to consciously remind myself that the outcome is the important thing. 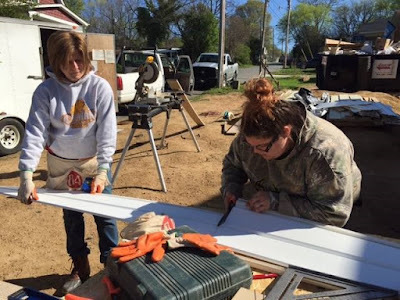 Megan is a member of the Swayze’s Sweethearts Women Build Team. 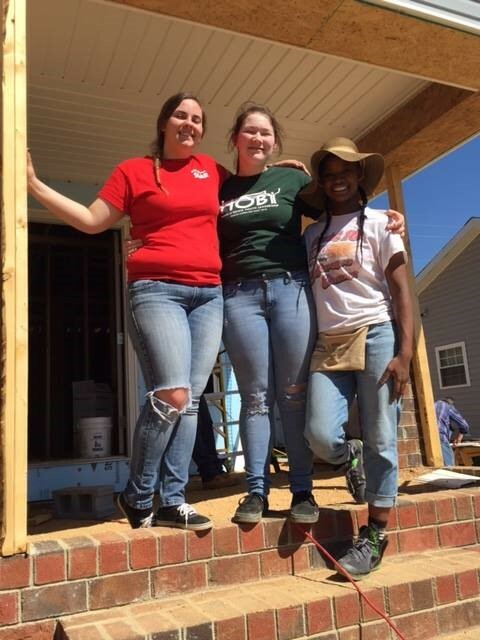 The Sweethearts helped to raise the first wall in Julie Clinkscale’s home in April. That event was a Roast Cutting moment for Megan because Megan grew up in a Habitat for Humanity home. Megan’s parents married young and their three children came along shortly. Megan’s family lived in an older home in Monroe, NC and only one of the rooms had insulation. During the heat of the North Carolina summer and cold of winter all five family members lived in that one room. Because the home was so old it exacerbated Megan’s sister’s asthma so she experienced a lot of breathing issues and all three children were often sick during the cold months. Megan was seven when her family moved into their new Habitat home. She remembers hammering a few nails into the wall during construction. Megan recalls her excitement to have her own bedroom. Megan remembers the new, clean, smell and how she and her siblings were fascinated by the furnace closet. She recalls feeling the warmth and love from strangers who simply wanted to help. 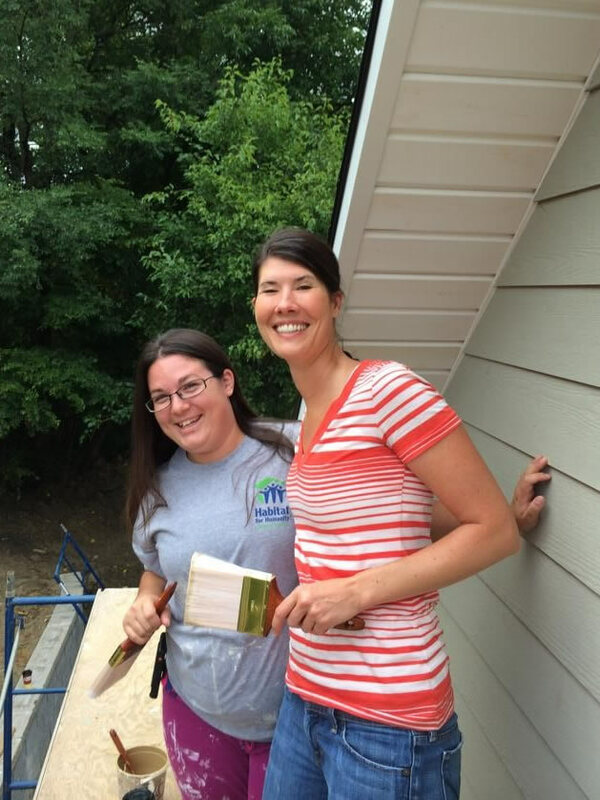 As an adult Megan understands that Habitat offers families the opportunity to change their lives. She appreciates knowing that there are good people in the community who care and who will rally around strangers to help them become homeowners. Today Megan knows the importance of giving back and is happy to be in a position to do some giving. One April evening as Megan helped teams of women work as one to raise Julie Clinkscale’s wall she looked over and saw five sets of children’s eyes watching. Five sets of eyes observed unknown adults setting foundations for their futures, constructing stability, creating possibilities. Megan’s eyes filled with joy and love because she KNEW what those little girls felt in that moment. Megan knows first hand what their new home will mean. And she felt overjoyed to play a role in their future success. Megan has come full circle. Today she is a dedicated wife and a mother who has worked in the medical field. Stability is very important to Megan and she’s willing to sacrifice to provide it to her children. She’s also willing to work for Julie Clinkscale and her grandchildren. Megan once stood on a Habitat worksite and watched unknown helpers hammer and sweat. Now Megan feels blessed to help provide the hand up she is so grateful to have received so many years ago. We mimic the behavior we’ve seen and perpetuate the behavior we’ve experienced. 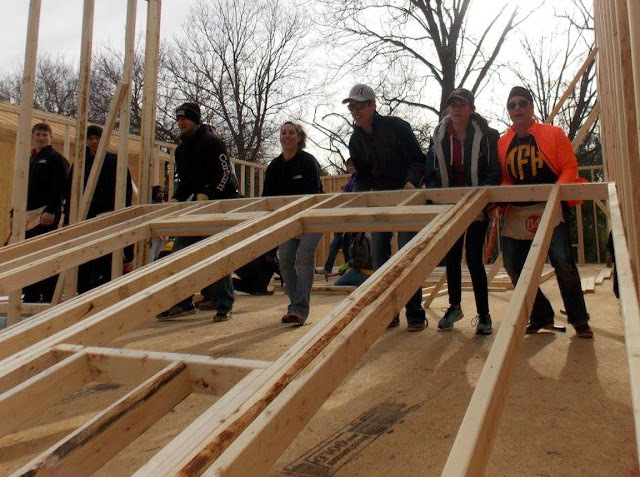 Each Habitat workday creates more than a floor or a roof. It builds love and constructs community that continues and increases with each repetition. One day those five little girls may continue the legacy and help another family get one day closer to home ownership. What image comes to mind when I think of empowering myself? Rosie the Riveter! Rosie the Riveter is an iconic WWII image used to recruit women into the work force. 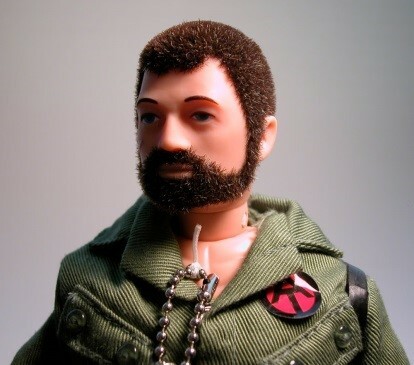 Since the end of the war, this image has become a symbol of feminine capability. Today, this image profoundly resonates within me as a symbol of my capabilities. When I began building my home, I also began building myself! With every nail I drove and every wall I raised, I built an inner strength housed within the resilience my experience with Habitat was constructing. 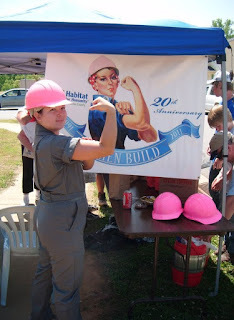 When selected to represent the 20th anniversary Habitat Cabarrus Women Build project, I was flooded with emotion. What an honor I thought to myself, attaching the image of a women’s strength to what I saw as my biggest feat. Obtaining home-ownership and securing a stable life for myself and family would soon be realized through my concerted efforts and those of women leaders throughout my community. 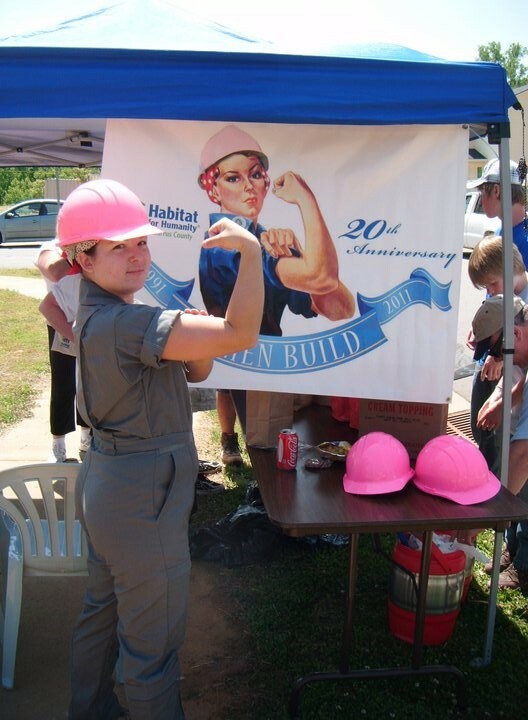 But my Women Build story didn’t begin with the start of Habitat’s 20th anniversary women build project and it has yet to come to an end! In high school, I joined a service club for girls called the Juniorettes. It was through this group that I was first introduced to Habitat for Humanity and the Women Build idea. 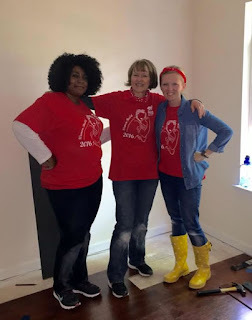 My Juniorette team volunteered to paint the interior of a home that was a Women Build home. with Development Director Katie Page. Then fast forward to 2009, I was about to graduate from Wingate University and knew I wanted a career that allowed me to serve others. So the school’s career counselor secured me a one-semester internship with the local Habitat for Humanity affiliate. During my internship I saw firsthand Habitat’s “a hand up, not a hand out” philosophy. 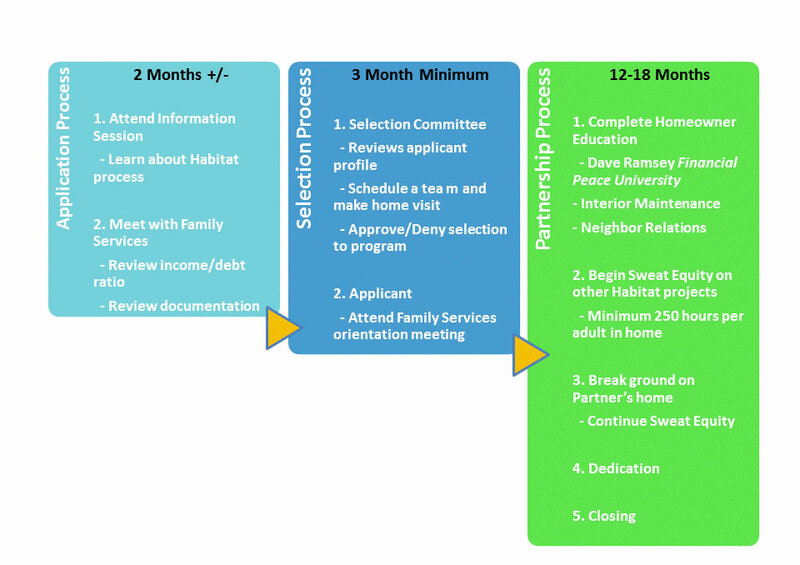 Although brief, during my time with that affiliate I began to learn how Habitat worked and how they changed lives by building people up! After graduation, I worked long, unpredictable hours for a very low wage trying tirelessly to simply provide for my young daughter. Despite my best efforts I couldn’t find another job and continued earning drastically less than my degree deceptively lead me to believe I would earn. I was living in a place that was not safe but couldn’t afford to live anywhere else. In 2010, a young man I went to high school with was shot because of a bad drug deal outside my apartment as I was unloading my daughter after a long night at work. The very next day I was reintroduced to Habitat, but this time as an applicant. Since the completion of my home, my life has continued to intertwine with Habitat and Women Build. In 2013, I was brought on board to serve as the construction assistant to our famous "Bob the builder." Then in 2014, I was offered a position at the affiliate as the volunteer coordinator. 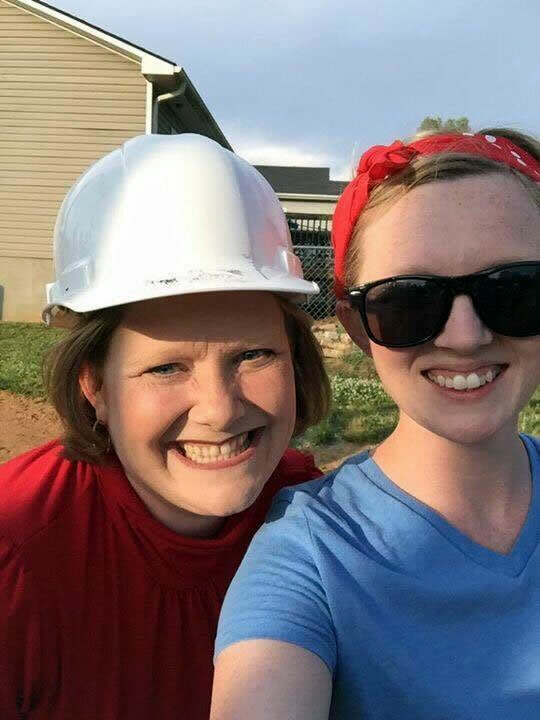 The crazy part here is that my assigned supervisor turned out to be one of those strong women leaders who lent a hand on the building of my Women Build home (I am forever grateful Katie Page!). 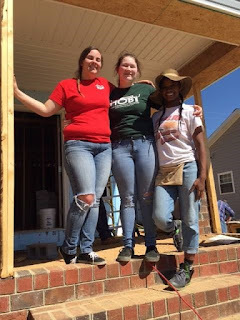 Once again I was overcome with excitement at the opportunity to build myself with the assistance of the strong women I looked up to and to serve alongside these women who had encouraged me during my partnership with Habitat (Shirley Kennerly this includes you too!). My Women Build story doesn’t end there though... Just recently, February 1st of 2016 to be exact, my brother passed away from a heroin overdose. I first learned of his addiction about two years ago, around the time I joined Healthy Cabarrus’s Substance Use Coalition. The coalition’s mission is to mobilize community partners to build a healthier community by reducing substance abuse and its effects, particularly among youth. It was through the efforts of this coalition that I learned about Naloxone and its ability to reverse an opioid-induced overdose. Unfortunately, my brother was alone when he overdosed and wasn’t found until long after he had last used. Despite this fact, the administration of Naloxone is what kept him alive long enough to make it to the hospital and for our family to say goodbye. 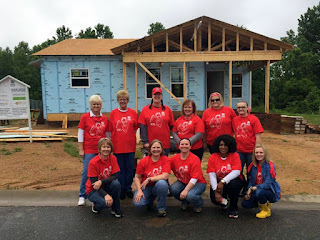 In honor of my brother, my friends and colleagues at the Cabarrus Health Alliance decided to put together a women build team to support our 2016 campaign. And guess what day they requested to come out and build? My birthday! Truly I believe this is God at work. I believe I have been called to my purpose, to not only serve the Lord but to serve another family. I get to give back the love and support that was so graciously poured upon me. As each Women Build team continues to grow and the funds to support this build continue to come in I am called to give praise; Praise to God for his unwavering love, Habitat Cabarrus for its continued efforts within my life and my community, and to Julie Clinkscale, the beautifully strong grandmother and caregiver of 5 remarkable young ladies who is working diligently to build her home with the title of this year’s Women Build. I am so excited to see this year’s project kick-off. Who knows…maybe Rosie the Riveter will come out to support us once again! April 10-16 is National Volunteer Week, which is a great opportunity to recognize the contributions of our generous volunteers, many of whom have been offering both their time and effort for many years. 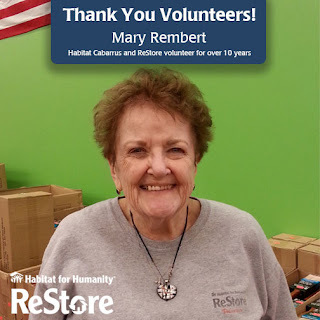 One such individual, Mary Rembert, has been volunteering with Habitat for Humanity of Cabarrus County and ReStore Cabarrus since 2005 (when our ReStore originally opened). Mary retired that same year, but her love of working with people drew her to a volunteer opportunity with Habitat where she helped with our Christmas gift wrapping. Soon after, she heard that a ReStore would be opening in the area and was excited to begin volunteering at this location. After a couple of store relocations and over a decade of service, Mary has a longer tenure than almost anyone else at our ReStore and is still just as excited to be volunteering. “My favorite part about volunteering with ReStore is the people I work with,” she said, citing her love of people as a primary reason she enjoys serving with Habitat. Mary works primarily at the checkout register, where she is “consistently friendly, efficient, and has fantastic customer service skills,” said Dale Irvin, General Manager at the ReStore. She volunteers every Tuesday and Thursday, brightening the day of every shopper with her warm, friendly personality. “I can’t imagine the Cabarrus ReStore without Mary Rembert,” Irvin went on to say. Mary also enjoys hearing customers tell her how nice they think it is shopping at the ReStore. She works hard to keep the store neat and orderly, so when people tell her that they appreciate how tidy the shop is, it makes her feel good. Mary understands what a long way creating a clean workspace can go in creating a great customer experience. In addition to her volunteer work at ReStore, Mary has kept busy during retirement in other charitable ways. She is a volunteer for both Hospice and her church, doing her best to make an impact in the community. 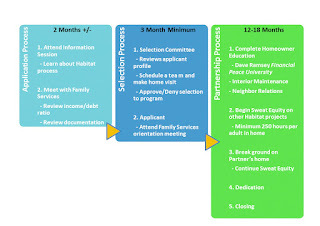 To learn how you can make a difference with Habitat Cabarrus or ReStore, visit http://www.habitatcabarrus.org/habitat/volunteer/opportunities. Did you know April 10 -16 is National Volunteer Week 2016? National Volunteer Week recognizes the many people across the U.S. and Canada who share their time and resources to many different causes for the greater good of society as a whole. My mother used to say that good manners are the glue that bind a society. Granted, she was usually telling me this when she wanted me to learn where various utensils should be placed on the table… but she was right. There are ties that bind us as friends, family, community, and culture. Now I instruct my own kids (with varying degrees of success) about how manners are really about making people comfortable. Individuals fortunate enough to have seen some of the world agree… While culture may determine whether you eat your dinner with a fork, chopsticks, or fingers – the ability to look at the person on the other side of the table and try to make him comfortable is universal. Society or culture evolves just like animals and humans through time and need. Joseph Henrich for example says human evolution has been greatly dependent on sharing information. Henrich offers the example of cooking. The practice of cooking spread by social learning across our ancestral human populations. “Cooked food’ became a selective force that ultimately shrunk our digestive tracks, teeth, and stomachs. Who knew? If society relies on information to evolve then volunteers keep the info train moving. I went back down the rabbit hole of research and discovered that volunteering provides another society-binding activity. There’s a great body of work to pull from about why exactly people volunteer but it seems to boil down to two reasons. One is symbolic and says volunteering is a display of values and beliefs through actions. The other is functional and says volunteering provides a match between a person’s psychological needs and particular personality traits. There’s a third aspect about volunteering that is just beginning to be studied and that is the benefit to the volunteer. People who volunteer regularly are healthier, more alert, and happier than their less philanthropic brethren. In other words - doing good does a person good too. We didn’t do a lot, but for a little while he had another adult to talk to and to provide assistance. His kids were entertained by my children while the smells and colors of fresh produce, artisan breads, and newly-picked strawberries kept his kids from whining and arguing. Afterward we all felt energized and happy and it wasn’t completely from the berries. Even in our little microcosm - volunteering was a positive experience. Habitat for Humanity runs on volunteers. 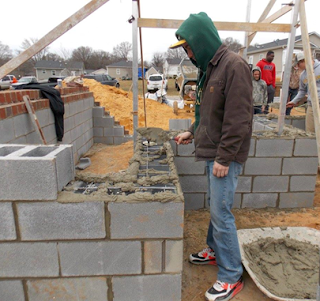 We help families achieve miracles because caring individuals are willing to give their time and talents on construction sites to help strangers achieve the dream of home ownership. Our magnificent volunteers display their values through actions and because they believe in causes bigger than themselves and they recognize an inner need to help others. National Volunteer Week provides the opportunity to bring awareness to the amazing contributions of volunteers and to encourage more people to donate their time to a local, national, or global cause. It started in Canada during WWII to celebrate women for their part in supporting the war and in the US in 1974. We urge you to take advantage of this week to nominate someone you admire for a volunteering award, share about your favorite cause on social media, and find an opportunity to volunteer yourself with Habitat Cabarrus or another cause that you feel strongly about.